Because Ireland is one leg of a MNC tax avoidance network. There's untold billions passing through Irish MNC books and they aren't paying tax on it in Ireland either. That money is just passing through our accounts and will come to rest eventually as profit in a tax haven. However it does allow Google executives to fly in from time to time to lecture in a pin-striped voice what business 'needs' from us. True economic blog by Constain had posted it re MNC tax havens but it was taken down few hours later.That was strange unless there was a legal or economic threat underfoot. "You're either running the business badly, or there's some fiddle going on," Austin Mitchell MP said. A Reuters report last month showed that Starbucks had paid no corporation, or income, tax in the UK in the past three years and had paid only 8.6 million pounds since 1998. Over this period it sold 3.1 billion pounds worth of coffee, prompting criticism from politicians and media commentators. Alstead denied Starbucks was shifting profits out of the UK and blamed high rents for contributing to the company's troubled record in the UK. He said the UK business only made a profit in the UK once, in 2006, despite him telling analysts on a conference call in 2009 that the UK unit was profitable and his predecessor listing the British operation in 2008, when asked about the foreign markets with the best margins. Members of the committee repeatedly criticized Andrew Cecil, Brussels-based Director of Public Policy for internet retailer Amazon, for failing to answer questions about the group's operations. Cecil declined several times to tell the committee the level of Amazon's sales in the UK. "We have not disclosed those figures ever publicly," he said. Amazon's annual reports do disclose this figure. The most recent regulatory filing gave UK revenues as 11-15 percent of total sales in 2011, an amount equal to $5.3 to $7.2 billion. Amazon did not respond to emails or calls asking for explanations about the discrepancy. "It's just not acceptable .. It's outrageous," the committee's chairman, Margaret Hodge MP, said of Cecil's inability to answer questions about Amazon's UK sales and corporate structure. 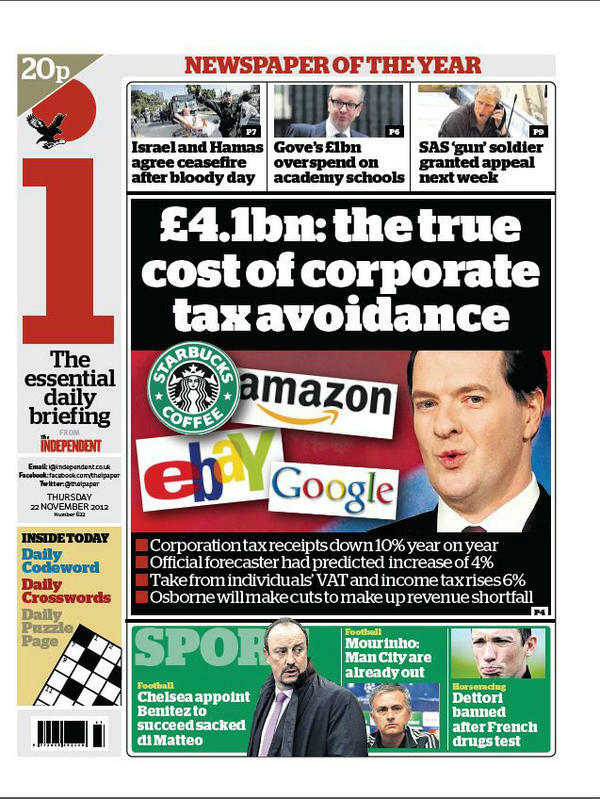 Amazon's main UK unit paid less than 1 million pounds in income tax last year. Google's filings show it had $4 billion of sales in the UK last year, but despite having a group-wide profit margin of 33 percent, its main UK unit reported a loss in 2011 and 2010. It had a tax charge of just 3.4 million pounds in 2011. The search engine provider books European sales via an Irish unit, an arrangement that allowed it to pay taxes at a rate of 3.2 percent on non-U.S. profits last year. Oh yeah, have been updating the friends n family in Ireland this weekend. According to Mark Paul in the ST It seems that Google has been given until Tuesday to supply details of the financial relationship between its British and Irish operations to the Commons Public Accounts Committee. Also being reported in India that Google was fined the equivalent of 10.8 million euro there for allegedly avoiding tax using Google Ireland, according to the same piece. Little aul Ireland gets a mention again. The Mayor of London makes his own refreshing contribution to the debate. THE government is preparing for an assault on companies such as Google that funnel their Australian income through low-tax countries such as Ireland and Singapore. Assistant Treasurer David Bradbury will outline the plan at a conference in Sydney on Thursday. His speaking notes refer specifically to Google and to a technique known as the "Double Irish Dutch Sandwich", which involves routing income between Ireland and the Netherlands. "This is not just about dealing with illegal activity,'' he will tell the Institute of Chartered Accountants national tax conference. ''This is about how the drivers of new business models in the information age are presenting great challenges for governments trying to make sure that companies are paying their fair share.